The Archaic period in Greek art is defined by the introduction of the ‘kouros-type’ into sculpture around 600 BCE. From their origins in the Orientalising period in Greek art (seventh century BCE) developed a new order of life-sized, free-standing statues made from stone, which are characterised by a formulaic rigidity. Within just one generation, this new type of votive offering could be found all over the ‘Greek world’. What role did networks play in the kouros' origins and its rapid dispersion? Fig. 1: New York kouros, Attica, ca. 600 BCE, 1.84 m high, marble, Metropolitan Museum, New York. When comparing ancient Egyptian statuary and the Greek kouros (a type of dedicatory sculpture in the shape of an idealised youth, developed in the Archaic period) it is hard to miss the formal resemblances between the two. These led to the idea that the kouros was inspired by Egyptian examples, with which the Greeks had come in contact when they established trading posts in the Nile delta. However, more recently scholars have pointed out the definite differences between the two types of statuary, and argued that the shape of the ideal youth was already present in Greek art before formalised relations with Egypt recommenced after the Dark Ages. Social Network Analysis can provide new insight into this ambivalence of affinity and difference, by exposing the network conditions needed for style to disperse and develop. The thesis of an Egyptian source for the Greek kouros is closely related to the history of Graeco-Egyptian mercantile and political relations in the Archaic period. In the second half of the 7th century BCE twelve Greek poleis co-founded the emporion of Naucratis in the Egyptian Nile delta, under auspices of the Egyptian king Psammetichus and later king Amasis. This date matches those ascribed to the first kouroi, which are thought to have originated near the end of the 7th century. Our knowledge from the events surrounding Naucratis' establishment comes from Herodotus and archaeological evidence. Naucratis functioned as a port of trade between the Greek and Egyptian worlds: the Greek poleis involved gained a monopolist position in the grain trade with Egypt, while the Egyptians concentrated foreign trade in one place, making it easily controllable. This special position of Naucratis made it the most important and a very powerful ‘weak tie’ between the pre-existing networks of the founding poleis and the Egyptian world. Therefore, Naucratis was not only a port of trade, but also a trading floor for ideas and knowledge. Fig. 3: Map with Naucratis' founders. the Egyptian ones. Second, that the Greek network was stable enough for the new knowledge to travel through the network quickly, because individual actors were connected to many nodes, who were connected to many nodes also. However, the network was also unstable enough to be sensitive to change. These qualities of the network, through which the knowledge of stonemasonry dispersed, point to a Greek strong-tie network 'in the making'. Interestingly, where the kouros-network exposes the configuration of a Greek strong-tie network in process, the historical circumstances of the Archaic period indicate the same phenomenon. The Aegean poleis in this period expanded their world views, engaging in intermediterranean trade and connectivity. This led to them needing to establish a new identity in the unstable new world. Through contact with radically different cultures and societies, the Greeks became aware of shared religious and cultural traditions. The kouros was one way of strengthening a common identity, through participating in a universal custom. Although the configuring Greek network was still sensitive to influences from culturally superior outsiders, like the Egyptian stonemasonry, they were also keen to absorb them into their own artistic and votive traditions, thus transforming them in something of their own. The kouros is a prime example of these dynamics, prominently articulated at Panhellenic sanctuaries like Delphi. Here, it also became clear that the kouros could function as a medium for peer polity interaction: its creation suggested wealth and power, and although the custom was universal and its shape generic, the kouros remained the distinguishable product of certain poleis. Fig. 4: Example of the use of grid formula’s to proportion the statue anatomically. Thus, Social Network Analysis allows us to situate the kouros’ origins within the historical circumstances surrounding Archaic connectivity. 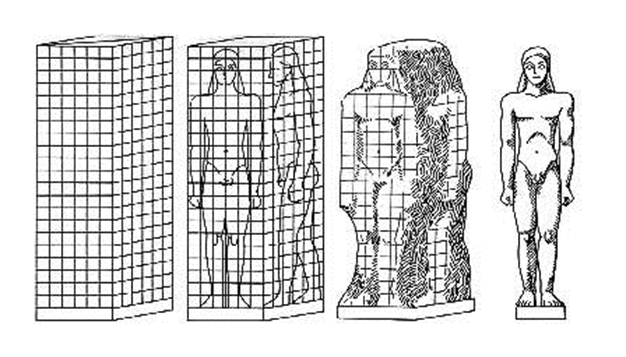 It shows how the qualities of the network, through which the kouros dispersed, indicate the emergence of a Greek strong-tie network as the result of expanded interaction with others, like the Egyptians or colonised peoples. The kouros should therefore be seen as one of the religious 'Panhellenisms' through which the Greeks tried to position themselves within intermediterranean cultural discourse. Religious votive statuary absorbed Egyptian techniques as the result of a cultural deficit, but it tried to emulate those influences by linking them with previously present Aegean traditions. In this way, Archaic connectivity posed a question through weak ties, but in turn mediated one of its answers through strong ones: the kouros-type in sculpture as universal custom of 'the Greek world'. AUSTIN, Michel M., Greece and Egypt in the archaic age (Cambridge 1970). MEYER, Marion, and Nora BRÜGGEMANN, Kore und Kouros: Weihegaben für die Götter (Wenen 2007). 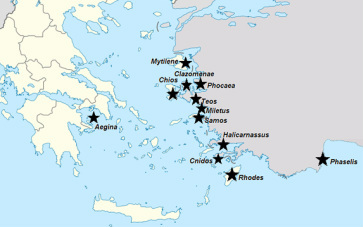 MÖLLER, Astrid, Naukratis: trade in Archaic Greece (Oxford 2000). SNODGRASS, Anthony M., Archaeology and the Emergence of Greece (Ithaca [NY] 2006). Banner: Nile riverbank, photo by Bruno Befreetv (via Wikimedia Commons). Fig. 1: Metropolitan Museum of Art, New York (www.metmuseum.org). Fig. 4: from R. Neer, Art and Archaeology of the Greek World, c. 2500-c.150 BCE (London 2012), p. 111.